Please note: The survey will be live from midday on Monday 4th February until midday on Friday 8th February. Dear Parents & Carers, please read on. This is important. We need your help to find out what you think about services provided for children and young people in Dorset, and are asking you to answer a short survey. (see link below). - The quality of what is being done needs to be better monitored and, if necessary, challenged to improve. A Written Statement of Action* was produced as a result of the inspection, and a lot of work has gone into improving services where this was felt necessary. Ofsted and the CQC will be re-visiting* * Dorset in the near future to see what has been done to improve the four areas highlighted above. Dorset Parent Carer Council need to be ready to provide information, gathered from you, the people who know, about whether things really have improved! So, we need your input, in the form of answers to our survey. Have the various bodies done what they were asked? Have things improved? Are Education Health & Care Plans now being produced on time? What is going really well for you? What isn’t going so well? Please tell us by clicking the button below! * More information about the Written Statement of Action & Dorset’s SEND Strategy can be find on the Local Offer. Would you like to have an opportunity to meet other parents and give feedback about the services you receive? We are looking for parents to help shape services locally and specifically feed into the following areas: SEND Local Offer, Dorset Council Strategic Planning, Teenager 2 Adult (Transitions), SEN Education, Short breaks & Leisure Activities, Early Years, Information/Advice & Support Services, Autism Spectrum Disorder, Health Services. You can apply by clicking here to go to our ‘Apply for Parent Panel’s page. Find out more about the four Preparation for Adulthood pathways, how to plan for the future, who might be involved & what the legislation says. Please click below to download the presentation from October’s Teenager 2 Adult Event 2018. In January this year we asked for your help promoting a survey for parent carers about SEN school transport. Thank you to all those who took part - the following infographics have the results. A friendly opportunity to learn what is meant by ‘Person Centred’ and why this approach is so important. Please see attached flyer and booking form below for more details. In October the County Council introduced a new way to fund schools to help children and young people with complex special educational needs or disabilities and an Education, Health and Care Plan (EHCP). As we promised, here's a link to the latest update with information about the new system, how it's working and answers to some of the questions you have asked. Click on the link below to read the latest information from Dorset County Council about the new banding system! "Have Your Say" - our biggest and most important survey ever! We want to collect your views so that we can go to Dorset Local Authority (DCC) and Dorset Clinical Commissioning group (CCG) with evidence of what families are telling us. We need to reach as many parents and carers as possible and to represent our special educational needs and disability community as a COLLECTIVE VOICE! The survey is for parents and carers of children or young people age 0-25 with special educational needs or a disability, with or without a statement or Education Health & Care plan. Your feedback is important to us! You can either complete the whole questionnaire or choose sections most relevant to you. The survey covers a wide range of services across education, health and social care and many other touchpoints in a parent-carer’s life. At the end of the survey we ask for your name and address. You need only supply this if you are a member of DPCC or The Xchange and you wish to claim a £5.00 gift voucher as a thank you from Dorset Parent Carer Council. We do recognise that many of families have more than one son or daughter with additional needs. However, as this is a comprehensive survey we have decided to keep one questionnaire per child/young person. If you wanted to tell us about more than one child/young person you will need to complete a separate questionnaire. We really do thank you for participating, for leaving your views and for your time. We'd like to wish all of our members, their families and all of the organisations and people we work with, a very enjoyable Christmas and a peaceful New Year, from all of us at DPCC. As we all know, Christmas can be a very challenging time for children & young people who have additional needs including Autism Spectrum Disorder, attachment needs and anxiety. We don’t have to tell you how schools and home life change at this time of year, the unexpected visitors dropping in, endless play rehearsals in noisy school halls, Christmas parties, watching films, decorations, glitter, dressing up, and as the whole atmosphere at school and home changes this can lead to some of children becoming very confused, overwhelmed and distressed at this time. A sample of a social story to support children at Christmas time, which you will need to personalise. Examples of additional visual supports that could be used. 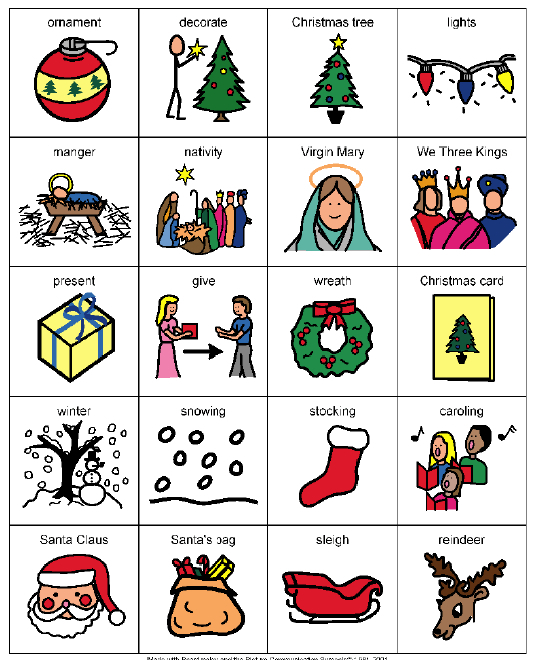 There is also a story written from the perspective of a child with ASD about how they find Christmas. We also know that you will have other useful tips and bits of information - please do share these through our Facebook page so we can help each other. We are writing to make you aware of two consultations currently being carried out by Dorset County Council that make specific reference to children & young people with Special Educational Needs or Disability (SEND). The relevant policy documents are attached, and we strongly recommend you take time to read them in full. The Home to School Policy and Post 16 Transport Policy are not SEND specific so to help you find the relevant sections we have highlighted text in yellow. These are the parts of the policy most likely to affect your child/young person. Also attached is a shorter easier to read guidance document produced by Dorset County Council. This also outlines the details most relevant in both policies to children & young people with special educational needs or disability. The consultation began on October 23rd and ends on 4th December. Please click below to download the 'Love Is Not Enough' PowerPoint presentation, co presented by DPCC and Dorset County Council which was shown at the Teenager 2 Adult 2017 event on the 16th October. Please click the button below to download our information leaflet on the event! Please click on the button above to view a PDF which includes more details about our upcoming event being held on Tuesday 28th March 2017, 10am till 2pm. We always appreciate more help with our work for disabled children and young people and their families so we've added a new page to our website to make it easy for anyone to get involved. It only takes a few moments to complete the online form. Click on the 'Volunteer' button at the top of the website to see the new page or click HERE.